There is a device called Canary All-in-One Home Security Device which can be used to track everything happening at your home in your absence. This is manufactured by Canary Connect Inc. This is an awesome device to track any unusual activity happening at your home, in a particular room, and you track this unusual activity from any remote, or even nearby places, through an app in your smart phone. The remote place may be your office, or an altogether different city, and nearby place may be just one another room in the same house. Only one room of your home can be tracked at a time through one Canary device. If you need to track all the rooms simultaneously, than you need to purchase separate device for each room. However, all the devices can be controlled by a single app in your smart phone. This app is known as Canary app and can be downloaded free from any app store and you are good to go. This device actually sends you alert messages on your smartphone, if it finds any unusual activity happening in the room where it is located. This device is really good for theft protection and home security. Suppose you placed the device in a room which is empty, and all the room doors are closed, and there is no one living in the room. Now suppose, suddenly someone do something to knock the door, or try to break the lock of the door of the room, than this sudden activity will be detected by the device, and it will send you alert message on your phone. Not only it will send alert messages, but it will also automatically record the scene during the unusual activity period, and that recording will be saved automatically on the device, and can be seen through the app on phone. Since there is also a 1080p HD camera fitted into this Canary device, you can immediately connect to the room, with the push of a button on mobile app, to see what everything is happening in that particular room, and that will be live on your phone. You can go live anytime even without receiving alert messages first from the device. Also, you can film (record) manually the scene going into the room live, and it will be recorded as a video in the device and could be saved. This may act as a proof of something unusual that happened nearby the device. As long as there is complete silence in the room, the camera in the device will not detect anything, and will not send you any alert message. But even when a fly starts flying in the room with some noises, the Canary device will alert you as the device is very sensitive. Also, in the latest version, it is possible to control the sensitivity of the camera in the Canary Device, because you do not always want to be alerted for just a slight sensitive activity, like the one of the noise of a fly or bee. This device actually works through an internet connection, as through bluetooth only, its not possible to track the room from distant places. Bluetooth has only limited range. The Wi-Fi is inbuilt in this device, and so its possible to connect this device through internet, and through this internet connection the device will be able to communicate with the app on your phone. This app is specifically built to track this device only. Also your phone must also have an internet connection for things to work, as you receive and send signals through internet only. 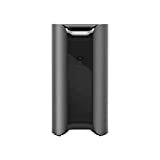 Also a power adapter is provided along with the purchasing package, to keep the Canary device powered ON all the time, as long as you want to track the room activities through it. Also there is a 90+ dB siren in the Canary device which is again controlled by a button on the app. If you find on the live screen that some unsuspected person has entered the room, just turn the siren ON and other members in the family in some other room, will get alerted or even neighbors could get alerted by high intensity sound of the siren. This is really a good product even to gift someone as its quality is very high and its professionally built. This is a good gift for a person (husband or wife or anyone else) who is too much worried about his/her home security. Its very easy to setup the device. First thing you need to do is to download the app, and install it in your smartphone. Then, simply follow instructions given in the app, and you will be able to connect the device to your smart phone easily, with all facilities on the app, to perform different tasks and functions. However, you need to open an account first with the Canary company before you can start using their app. This can be easily done, if you have the internet connection in your smart phone where you will download the app. There are three main modes in the app which are armed, disarmed and privacy. In privacy mode everything is disabled, and the device will not record anything, and will not send any notifications. Privacy mode you may want to use when you yourself at home, and do not need any security guard like Canary device. Disarmed mode does everything other than sending alert messages or notifications. Armed mode basically involve all features enabled, when you are not at home, and want to track what everything happening at home. There are several other features in the device as well which you can know through this video review of the product. This unique padlock can be unlocked (opened) using your fingerprint (registered in app in smartphone) instead of key and code. This smartphone can be used to trick guests arriving at home as it actually looks like a cordless phone. This device can be fitted to collar of the dog and can help to check with your dog activity and health.